Our tremendous years of experience and learning have made us the main producer, wholesaler and supplier of Two Wheeler Covers. 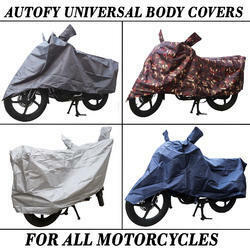 We are a most trusted name in between the topmost companies in this business, instrumental in offering a high-quality array of Universal Bike Cover. It helps protect your bikes from sun light , rain & use when your bike is parked. These covers are made using raw material like parachute, silver tech and metty. 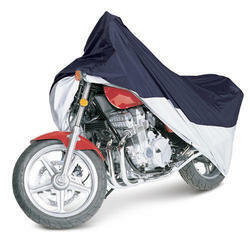 If you don’t want to wash your bike every day, cover it with this bike cover when you’re not riding it. Made of polypropylene, it keeps your two-wheeler protected from weather and weather related damage. Features: Protects from wet,humid,dusty climatic conditions and water resistant.